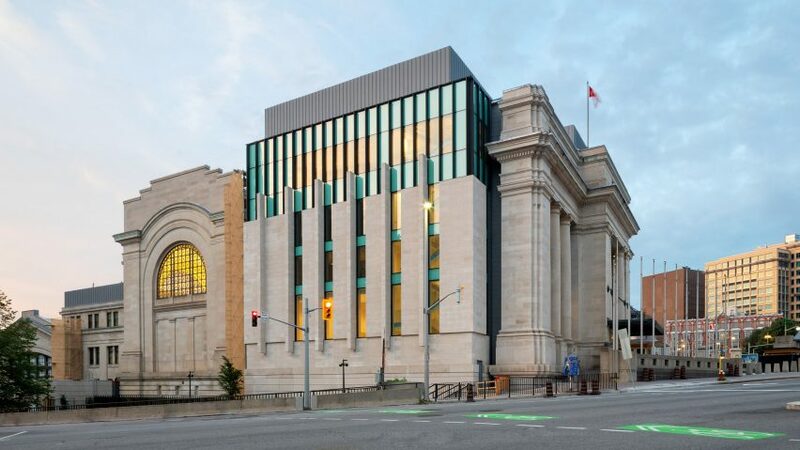 Canadian firms Diamond Schmitt Architects and KWC Architects have completed the transformation of a historic 20th-century train station in Ottawa into the temporary home for Canada's upper house of parliament. The Senate of Canada Building will provide an interim meeting place for the country's senators, while its nearby home in the capital city, Centre Block on Parliament Hill, undergoes restoration. Designed by Toronto-based Diamond Schmitt Architects and local firm KWC Architects, the project involved the restoration and overhaul of the city's former central train station. Located at 2 Rideau Street, the structure was built in 1912 and provides an example of the beaux-arts architectural style, which originated at the École des Beaux-Arts in Paris, and flourished from the mid 19th-century to the end of the 20th-century. Beaux-arts is known for its mix of the decorative French neoclassic, gothic and renaissance styles, alongside modern materials like iron and glass. Diamond Schmitt Architects and KWC Architects worked Toronto-based ERA Architects as the heritage consultant on the project, to respect the landmark's original features. The team expanded the long-neglected blank eastern facade with a glass addition that Diamond Schmitt says is "reimagined as a modern interpretation of the building's stone-columned, beaux-arts facade". Inside, the project involved updating the general waiting room and concourse, and adding new committee and meeting rooms, offices and public space in the station. The Senate Chamber room occupies the former concourse, while the waiting area – or the former grand hall – is defined by an open area with an elaborate arched ceiling, pillars and two sets of stairs. Two golden volumes with bronze facades have been inserted here in the former Grand Waiting Room, to house committee rooms that face each other. 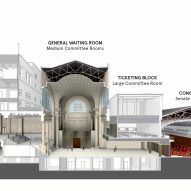 The firms preserved many of the interiors inside the Ottawa station, which is modelled after New York City's demolished beaux-arts Penn Station, such as its marble floors and cast iron Diocletian windows, and an elaborate vaulted ceiling covered in plaster. Lost and damaged plaster elements were restored, while paint analysis was used to provide clues to the original colour on the faux travertine walls. Other details aim to reference Canadian heritage, such as maple leaf shapes and the use of wood. "This project provided a remarkable opportunity to investigate and engage in a range of design innovations to introduce a new programme in a heritage building, to represent and raise the profile of the Senate's role in Parliament, and to convey Canadian identity through contemporary interpretations of national symbols and iconography," said Diamond Schmitt Architects principal Martin Davidson in a statement. The team worked with Phil R White, who is the dominion sculptor of Canada, to add these details. White's position involves the creation of original works of art for the nation, and is a rare government-salaried permanent role – no such position exists in the UK or the US. The Senate Chamber and three committee rooms feature walnut doors carved with the maple-leaf patterns. White created these by hand-carving wood with 10 different leaf patterns based on native species of maple trees. He then produced high-resolution 3D scans of each leaf, and the digital images were sent to a CNC machine to create profiles on the doors. Maple leaf shapes are also found in a kiln-fired decorative cast glass wall that separates the chamber from the antechamber – a space used by senators ahead of a call to session. "Working with the [Canadian] artist Joel Berman, the 3D information of the maple leaf patterns [for the glass panels] was re-made using ceramic moulds which were in turn hand-carved by another artist, Daniel Masse, based on the Dominion Sculptor's original carvings," said Diamond Schmitt Architects. Other details evoking Canadian heritage are wood-panelled walls with carved pilasters that resemble a pinecone pattern. These walls frame the shields of the provinces and territories. The speaker's throne was made from Vancouver Island white marble, with the Canadian coat of arms placed on top. Monumental perforated bronze panels act as facades for two committee rooms in the station's high-vaulted Great Waiting Room, which have large open gathering areas above. They measure 46 feet (14 metres) long and rise 19 feet (six metres) tall. The golden facades are imprinted with photographic imagery of Canadian landscapes – including Moraine Lake in Banff National Park, Cape Race in Newfoundland and Labrador (the most easterly province of Canada), and a logging train on Vancouver Island. The images are upscaled and transposed into abstract, halftone patterns onto the screens, which also "double as acoustic baffles". "They are mounted on top of sound-absorbing insulation and absorb sound that otherwise would reverberate in such a large hall," Diamond Schmitt Architects said. 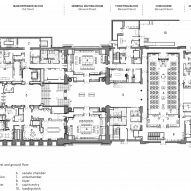 The firms involved also had to overhaul of the building systems, and adapt features to meet with contemporary seismic, accessibility, and life-safety codes. Canada's Senate will occupy the building for 10 years while its long-standing home at Centre Block is renovated. Following this, the refurbished station is planned to accommodate offices. The Senate of Canada Building is the latest iteration of the old station, which became the Government Conference Centre in 1973, and has been largely off-limits to the public for 50 years. Diamond Schmitt Architects hopes that the renovation will give new life to the structure. "The Senate of Canada Building provided a rare opportunity to represent the Senate to a new generation of Canadians," said Diamond Schmitt Architects. "This was achieved through... a narrative of elements and details evoking a shared history across broad geographical boundaries." Diamond Schmitt Architects was founded in 1978 by Jack Diamond and Donald Schmitt. The firm has completed a range of public buildings, particularly arts centres, including a white industrial structure for Emily Carr University of Art & Design in Vancouver. Located along the Rideau canal, The Senate of Canada Building sits directly across from the city's brutalist National Arts Centre, for which Diamond Schmitt designed a glass entrance and extension. Photography is by Tom Arban unless stated otherwise.